As many have learned already, honeybees all over the world and here in the United States have had a rough go of it in terms of pollination and population losses, which is believed to have been caused in large part by pesticides, pathogens, varroa mites, colony collapse disorder (CCD), habitat loss, and an assortment of other issues. On the other side of these pollination concerns, however, is honey production, and while it’s received less attention than beekeepers losing 40 percent of their colonies in 2016, it’s still a concern. On March 14, 2018, the Department of Agriculture’s National Agricultural Statistics Service published a report stating that U.S. honey production in 2017 had dropped nine percent from the previous year for bee operations with at least five colonies. According to this report, operations with at least five bee hives produced around 148 million pounds of honey, with the total hives numbering 2.67 million (four percent less than in 2016). Honey yields per hive dropped five percent and averaged about 55 pounds, with even producer honey stocks lowering to almost 31 million pounds by December 15, a 26 percent drop compared to 2016. In addition to these considerable drops in honey production, bee operations with less than five hives proved to be down as well in 2017, yielding only 599,000 pounds—down about 22 percent from the previous year. In terms of actual hives, they numbered around 20,000, which is down 17 percent from the year before, with the yield averaging around 30 pounds per hive, a drop of six percent compared to 2016. Another important statistic from this report regarding drops in honey production is the fact that income for pollination services, specifically for bee operations with at least five hives, totaled around $435 million, which is a 29 percent increase from the year before. Oftentimes, beekeepers with larger set-ups will rent out most or all of their hives outside of honey season to large agricultural operations, with almond orchards in the state of California being one of the greater recipients of these services. 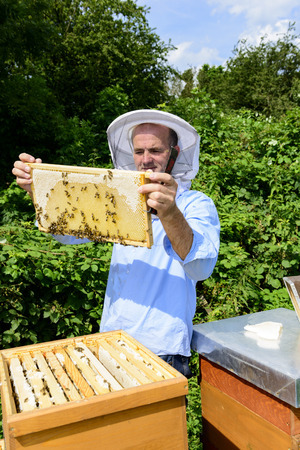 With the U.S. honey industry seeing declines and pollination services increasing, beekeepers and lawmakers need to figure out how honeybees and other bee species can be protected against the factors that threaten them. As the honey decline shows, profit can eventually turn into loss, and pollination services can easily see decline in the near future as well, especially with colony collapse disorder still being the mystery it is today—we will just have to see what next year looks like.